Easter weekend is always a busy time at Skipton parkrun. This year we had beautiful sunshine as well, which meant that a record turnout of 277 parkrunners came to Aireville Park to help celebrate Skipton's 300th parkrun. We had 11 people who ran their first ever parkrun with us this weekend, another 55 previous parkrunners from elsewhere who ran their first Skipton parkrun. It was great to see you all and we look forward to seeing you back soon. There were 10 people at our 300th event who also attended the first Skipton parkrun in September 2013. 2 of them have kindly offered to put pen to paper and give you their perspectives on the run. Firstly from Paul Norman, who has been a stalwart volunteer and part of the Run Director team from day 1 of Skipton parkrun. On Saturday 20th April I was at Skipton parkrun number 300. I was also at Skipton parkrun number 1 on 7th September 2013 and have been at quite a few in between. My view of parkrun has changed somewhat since we started. I was part of a small group who established Skipton parkrun and have openly admitted (subsequently!) that at the time I was sceptical about how many people would actually run and, more of what I perceived to be a ‘problem’, that those organising then would be lumbered with a week-by-week commitment. Since then, I have also acknowledged I am delighted to have been proved wrong. Gradually, more and more people have both run and volunteered and, very importantly, a great group of people are now part of the organising / run director team. The Skipton parkrun community is now such that I can’t walk into town without bumping into someone who I know because of parkrun. I see people running in events elsewhere who started their running career building to and doing 5k in Aireville Park and I also people volunteering at other events! I was delighted to join the Skipton parkrun community on Saturday 20th April to celebrate their 300th parkrun. 277 runners enjoyed the glorious Easter Saturday weather, with Aireville Park looking particularly splendid. I was one of 194 runners who ran the first Skipton parkrun on 7th September 2013. The course has changed since I first ran it, and has continued to be a popular event for regulars and tourists. Saturday’s runners included 42 tourists, 58 runners who achieved PBs, and 37 junior runners, including 8 aged 10 or under. Not to mention the dogs who ran with enthusiasm alongside their owners. We will definitely be back to both volunteer and run this wonderful parkrun. This week 277 people ran, jogged and walked the course, of whom 66 were first timers and 58 recorded new Personal Bests. Representatives of 45 different clubs took part. Today's full results and a complete event history can be found on the Skipton parkrun Results Page. The male record is held by Tom ADAMS who recorded a time of 15:51 on 22nd February 2014 (event number 27). The female record is held by Rebecca MURRAY who recorded a time of 17:58 on 4th August 2018 (event number 261). The Age Grade course record is held by Angela OLDHAM who recorded 90.48% (22:24) on 15th July 2017 (event number 207). Skipton parkrun started on 7th September 2013. Since then 7,426 participants have completed 43,788 parkruns covering a total distance of 218,940 km, including 8,385 new Personal Bests. A total of 480 individuals have volunteered 4,213 times. This week, in addition to the usual fascinating fact and figures, we have the view from the takeover RD chair thanks to Dr. Kirsty Pettit who volunteered to be RD for the day as part of the Craven GP takeover. 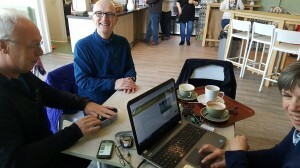 Not one to do things by halves, Kirsty even took on the results processing over a post run coffee, ably assisted by Dr. Andy Sumnall who experienced the therapeutic benefits of token sorting – all 220 of them. As the photo shows, both activities are highly enjoyable! What a privilege to be RD at Skipton, and be a tourist from my usual parkrun at Cliffe Castle in Keighley. GPs, volunteers, staff and the voluntary sector, from Dyneley House Surgery, Fisher Medical Practice, Townhead Surgery in Settle, plus Kilmeny, Farfield, Holycroft and Haworth practices in Keighley came to help, representing the 3 communities of Craven, Airedale and Wharfedale, on behalf of the GP Networks of WACA and Modality. Tai Chi as a cool down was supplied by Hun Tun Tai Chi, and there was the opportunity for BP checks and to discuss support for people with Parkinson’s disease and cancer. All 219 runners enjoyed glorious spring sunshine, and the medics enjoyed supporting people in getting fit and healthy. Thank you to people who came to support the run, and share their stories of weight loss and fitness through lifestyle changes and activity. We all look forward to supporting our communities in ongoing healthy living. On behalf of the Skipton parkrun team may we thank all of the Craven GP takeover volunteers, particularly Dyneley House for taking the lead in organising it and the support from Fisher Medical and the other WACA and Modality Group practices. A couple of club shirt achievements slipped though unclaimed this week. Firstly Noah Peace , well done on achieving your 10 shirt as a junior and secondly Catherine Hinchcliffe, well done on getting your 50 shirt! Next week … Skipton parkrun 300 for which the weather is looking very promising..anyone fancy bringing cake? This week 219 people ran, jogged and walked the course, of whom 38 were first timers and 41 recorded new Personal Bests. Representatives of 30 different clubs took part. Skipton parkrun started on 7th September 2013. Since then 7,360 participants have completed 43,511 parkruns covering a total distance of 217,555 km, including 8,327 new Personal Bests. A total of 476 individuals have volunteered 4,188 times. I think today definitely was the first (parkrunning) day of Spring; a glorious sunny, warm day saw 205 people cross the finish line in Aireville Park and 44 new PBs recorded. It was great to see 12 people undertaking their first ever parkrun; Simon GREENING, David JONES, Si LANCASTER, Charlie CAYGILL, Jane CLEAVER, Nancy THOMPSON, Demy DOWLEY, Donna FRANKLAND, Linda WALKER, Victoria BRITTON, Ollie MILLS and Sharon EELES we hope to see you all again soon. It was also great to see visitors from all over the UK and also from Brisbane, Australia - hope you enjoyed Skipton. Skipton parkrun was bought to you this morning by Paul NORMAN, Gillian MAYFIELD, Wendy ASHLEY, Tom ASHLEY, Chris OVENDEN, Paul WILSON, Michael MCINNES, Darren NUTTALL, Molly BOND, Charlie BOND, Rachel BOND, Lee HAMBLIN, John N CUTHBERT, Mary DOOTSON, Elliot WOOD, Nigel PEPPER, Denisa FRANCIS, Andrew SUMNALL, Craig TURPIN and Emma GIBBONS. We have two special runs coming up, next week is a takeover Skipton's doctors practices and the week after will be Skipton's 300th run. Another dry Saturday morning in Aireville Park and another good turnout for parkrun. Tourists from South London, Wakefield and York joined the locals and regulars and all were timed, scanned, cheered on, processed, marshalled and generally looked after by our fantastic band of volunteers - including Skipton stalwart Phil Davies notching up his 100th volunteering stint!!. A special mention for Kate Dobson who was the only one to turn up in her PJs!! This week 198 people ran, jogged and walked the course, of whom 27 were first timers and 48 recorded new Personal Bests. Representatives of 23 different clubs took part. Skipton parkrun started on 7th September 2013. Since then 7,292 participants have completed 43,087 parkruns covering a total distance of 215,435 km, including 8,241 new Personal Bests. A total of 459 individuals have volunteered 4,148 times. Skipton parkrun is very special to me. 18 months ago, I was taken very ill. Unfortunately, this is something that I discovered I would never recover from, but when I was feeling down about it all, I joined the Skipton parkrun volunteer team and it was the best thing I did! The team are amazing and so supportive. They gave me all the training I required and these days, I’m Run Director at a new local parkrun run in Bingley, Myrtle parkrun. And that’s all thanks to this lovely lot. So, if you are ever considering volunteering, then please do as the team are amazing. Parkrun also gave me the idea to start a run group for beginners, and Trail Snails Bingley was born! Today was our 200th run as a group, so of course, we came to celebrate at Skipton parkrun. The weather was much kinder to us this week and as always, the volunteers were wonderfully cheerful and supportive. Lovely Judy does a shoe collection every so often and the shoes are donated to Africa, to those who can’t afford expensive shoes. So of course, we came armed with donations of shoes for the appeal. James was Run Director today (Stirling job, James!) and delivered the usual pre-run briefing with Judy talking a bit about the shoe appeal – which got a huge round of applause. Trail Snails even got a mention in the run brief. Then we were off. Some of my wonderful Trail Snails had informed me that they wanted a sub 30 time and their wish was my command! I dragged a few of them round, albeit cursing me, in their desired sub 30-minute time. 27 minutes in fact. Can’t say I don’t do anything for them. Turns out, it was a good day for PBs for the Trail Snails as we had nearly a full house of PBs this morning. Excellent effort. As usual, we stand near to the finish line, cheering every one of our last runners and it was great to see fellow runners joining our cheer squad! Then it was on to celebratory cake, because, of course, all athletes eat cake. It was so great to be approached by other local runners too, joining in our celebrations. All in all, a fabulous morning a Skipton parkrun. Thank you, crew. See you again soon. This week 236 people ran, jogged and walked the course, of whom 45 were first timers and 43 recorded new Personal Bests. Representatives of 19 different clubs took part. Skipton parkrun started on 7th September 2013. Since then 7,265 participants have completed 42,889 parkruns covering a total distance of 214,445 km, including 8,193 new Personal Bests. A total of 458 individuals have volunteered 4,130 times.